Which lights do you need for the bathroom? How do you install a mirror light correctly? How wide should the light above the mirror be? Warm white or clinical – which luminous colours are well-suited to bathrooms? How many lumens or watts should my bathroom lighting have? Can you get colour change lights for the bathroom? Which IP codes apply to which area? 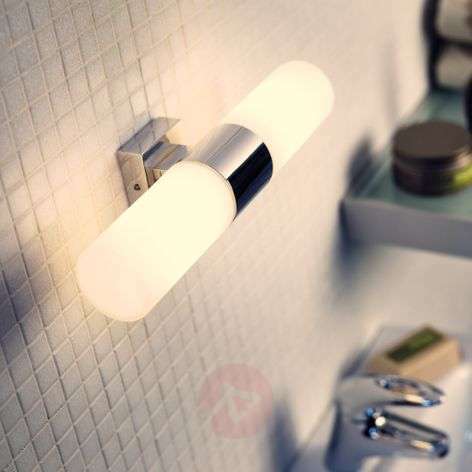 You need more than just a light – a bathroom needs a lighting concept! Don’t know which bathroom light to choose? 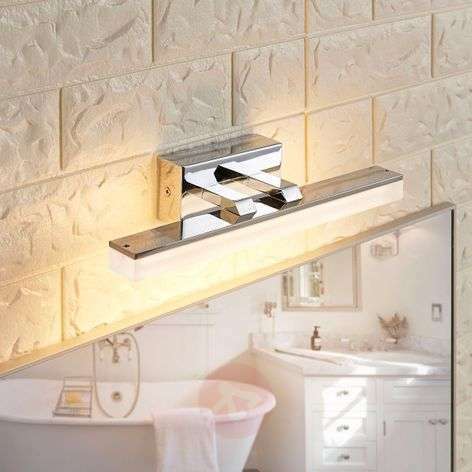 Take a look at our Guide to bathroom and mirror lights. Our grandparents and great-grandparents may still remember having to use an outhouse in the backyard. And an extra lavatory? It hasn’t always been standard issue. But many households have now turned bathrooms into a real part of the home and have created true temples of well-being. And for this: you need to clear the stage for atmospheric lighting concepts. A ceiling light – for the so-called general lighting – is always a good idea. It is really all you need when taking a quick shower. 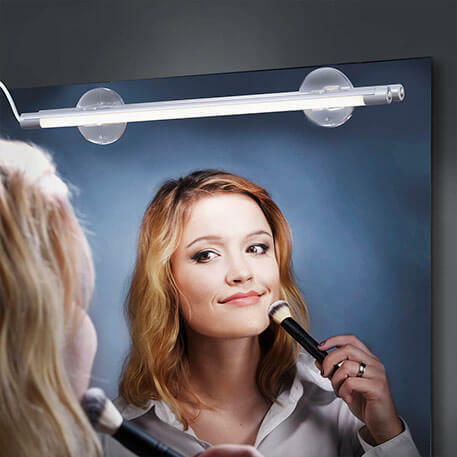 But when it comes to shaving and applying make-up, you need more targeted lighting: a mirror light is perfect here. And if you want to enjoy a relaxing soak in the bath? You certainly don’t want bright lighting. Lovely, warm lighting accents are perfect for these moments of calm. Or perhaps dimmed light sources. Have you ever thought that you had applied your make-up perfectly only to find that it actually looked completely over the top? Or perhaps you have congratulated yourself on the perfect shave only to later realise that it was less than perfect in daylight? If you have ever experienced either of these, you need to take a look at your mirror lighting. 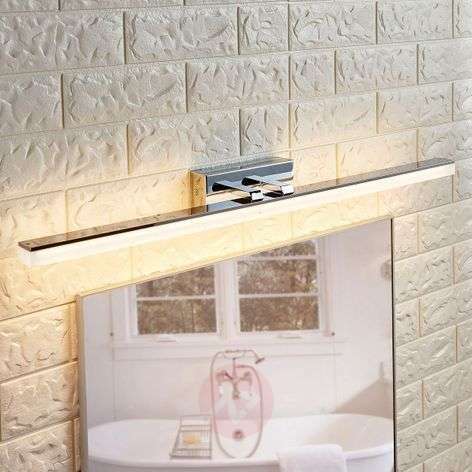 Mirror lights are affixed and operated in a variety of ways: some models are simply clipped or inserted onto the mirror; others are mounted using a simple suction cup; some are screwed onto the wall. 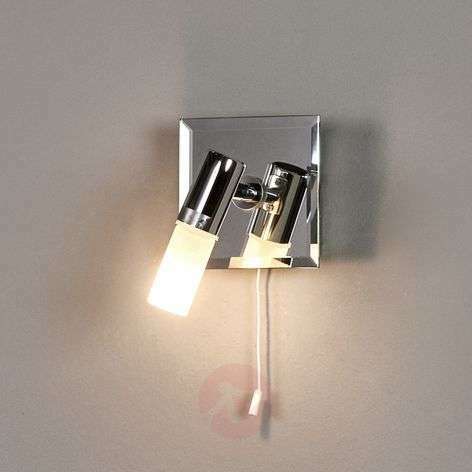 Depending on the model, mirror lights are operated using a wall switch or a switch on the light. 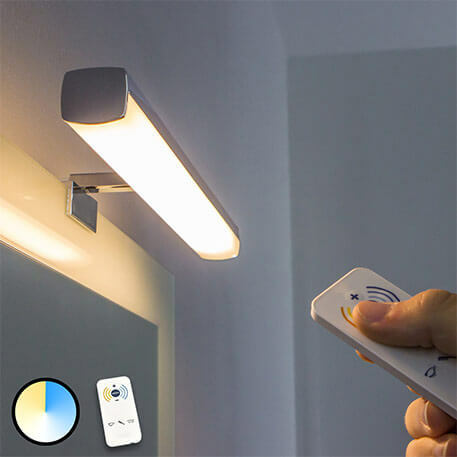 Some mirror lights can be controlled by remote control. And, as you can never have too many power points, you can even get mirror lights with an integrated power point. Perfect for plugging in your hair dryer. In the case of indirect lighting (where the light is directed downwards or upwards and downwards), it should be almost as wide as the mirror itself. But it shouldn’t be any wider. That is the best way to ensure even illumination for the mirror. Lights that direct the light into the room can be smaller. Needless to say, your preferred design and personal preferences with regards the lighting play a big roll. It depends: do you want to enjoy a long relaxing soak in the bath or do you want to put on your morning make-up? The latter demands cool white, clinical light between 3,300 kelvins and 5,300 kelvins. By contrast, if you are brushing your teeth before bed, warm white light at less than 3,300 kelvins is more pleasant as it won’t over-stimulate you and wake you up. Take note: watts refer to the energy consumption of the bulb; lumens refer to the light output. The latter is vital for comparing the brightness level of bulbs. Deciding how bright your bathroom lighting should be is, however, a matter of taste. Our team of experts are happy to provide tips for specific cases – contact information is provided below. Nothing can set the scene better in your own spa oasis than the perfect lighting. Nowadays you can choose between a huge range of lights offering multicoloured functionality. PHILIPS Hue products allow you to choose between 16 million colours. 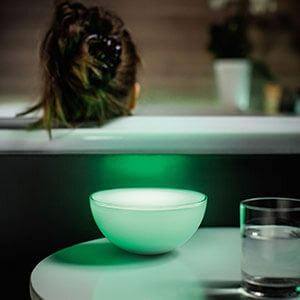 As such, you can enjoy a different colour ambience in your bathroom each time you use it. Unfortunately, this may cause a bit of a queue to form at your bathroom door! After all, your other family members are sure to love the colourful lighting scenarios in the bathroom as much as you do. The bathroom is not the place to try your hand at DIY. The words “plumbing” and “wet room” say it all: bathrooms are full of splash, spray and steam. As such, there are special regulations when it comes to the installation of lights and qualified electricians know these regulations and can act accordingly. As bathrooms are regularly wet, special safety regulations apply to lights. They are listed under DIN VDE 0100 Part 701 and should be implemented by an electrician. Interesting to note: according to the regulation, a bathroom is divided up into different safety zones in which lights with different IP codes must be used. The IP code is, for example, dependent on the distance of the light from the shower. 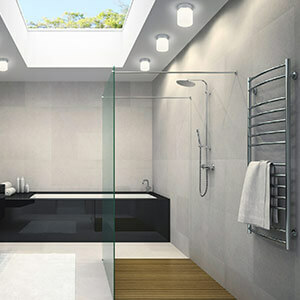 Lights directly above the shower and bathtub should have IP code IP65 to be on the safe side. The greater the distance from the directly wet areas, the lower the IP code for the lights can be. In some areas, you can even use lights without an IP code. A qualified electrician will be able to advise here. 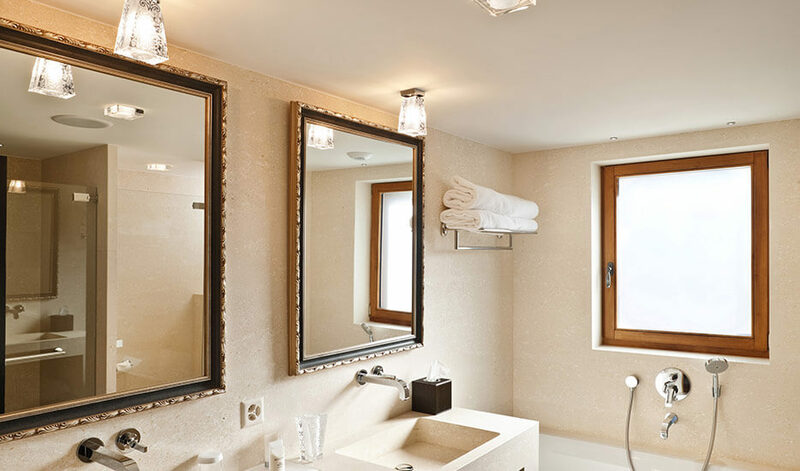 Would you like more information about bathroom and mirror lights? Why not speak to our team of experts? Phone them on +353 1 699 2138 or use the contact form.